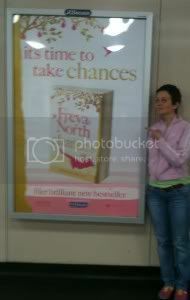 Today I welcome Freya North to my blog. 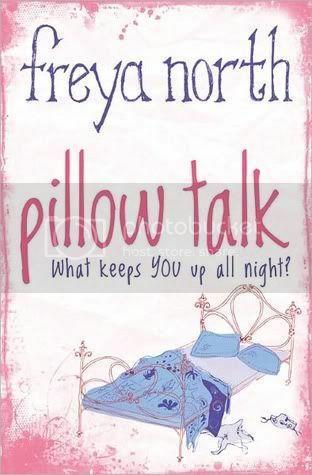 Her new book Pillow Talk is out now from Sourcebooks. And at the end of this interview you can win a copy. I am 43 - but frequently I catch my children (Felix 10, Georgia 8) giving me a look that says "Oh Mummy, do grow up!". I am a single mother and I live on a small farm with the children and our dog, Twig (an English Pointer) in a county just outside London. We have fields and woods and a stream and 15 horses graze the land (just the one is mine - Nathan!). I've ridden horses since I was a child and am passionate about Parelli Natural Horsemanship. I am 5'2", I take pottery classes each week. I'm a chatterbox... I make a knock-em-dead lemon drizzle cake. 2. Could you tell me about your newest book, Pillow Talk? Pillow Talk won the Romantic Novel of the Year Award in 2007. It's about giving first love a second chance - and the hero and heroine, who loved each other from afar when they were school kids, come across each other by chance years later. The novel is set partly in the jewellery quarter in London (Petra is a jeweller) and partly in a boys boarding school in the North Yorkshire countryside (Arlo is the music teacher). It's also about feeling safe enough to finally share your fears - and to ultimately bury any skeletons you have lurking in your closet. All in all, it's an unashamedly romantic love story - and raunchy too! 3. I read that you love research. What kind did you do for this book? I read a tiny news piece in the paper about a teenager waking up in her nightgown along the arm of a crane having sleepwalked there - thus began by fascination with sleepwalking which became one of the themes for PILLOW TALK. Similarly, after a robbery at my home, in which I lost all my jewellery (I didn't have much - but what I did have was of great emotional value) when I started to replace items with the insurance money, I found a pair of earrings with tanzanite - and started to read up on this beautiful gemstone, which is almost a character in itself in Pillow Talk. I interviewed many sleepwalkers and sleep specialists - and I spent a lot of time at the Tanzanite Foundation which ensures the route to market for this rare and beautiful stone is ethical. 4. Who would you picture playing the leading roles if this book was turned into a movie? I asked my facebook fans this very question - as the characters are so distinct in my mind's eye I just couldn't ascribe actors to them! Ultimately, Rufus Sewell was to be Arlo - and Emily Mortimer was to be Petra. 5. Could you tell me about a little about all the other books you have written? I'm afraid that as there are 11 of them and as I'm busy writing my 12th I'll have to direct you to my website www.freyanorth.com where each and every book is featured! My first, SALLY was about a primary school teacher who wants to reinvent herself as a femme fatal, CHLOE featured a young woman who travels the four countries of the UK during the four seasons of one year and meets a different chap in each place, POLLY does a teachers' exchange with a school in Vermont - and swaps more than just her job. CAT is trying to heal from a broken heart and further her career as a sports journalist so she follows the Tour de France, FEN has to decide between two men: one rich, one poor, one her age, one 20 years older, one living in the town, one in the country. PIP is a clown doctor who thinks she can get by just fine without men or money. LOVE RULES looked at whether you listen to your head, your heart or your best friend when it comes to love and lust, HOME TRUTHS was about mothers, daughters, lovers, liars. Then came PILLOW TALK. Then SECRETS (which Source books will be publishing next). CHANCES has just been published to great acclaim in the UK and RUMOURS is underway for next Spring. Phew! Can I take a sabbatical?! 6. Are you working on something new and exciting at the moment? Currently, I am writing my 12th novel Rumours - it is set in a small village in the county in which I live. It centres around the sale of a wonderful mansion - and how this affects so many people in the village. So I've been nosing around some magnificent country houses all in the name of research! On the whole, though, my work is driven by the characters themselves. I believe you can have the most intimate plot - but if the characters aren't fleshed out, then the reader won't really care what happens! Therefore, Rumours has a cast list of eccentric, entertaining characters - each of them could have their own novel! The heroine is called Stella, the hero is called Xander and the book will be published in the UK next Spring. By day, Petra Flint is a talented jeweler working in a lively London studio. By night, she's a sleepwalker troubled by a past she can't put to bed and a present that leaves her clinging to an unsuitable boyfriend. Arlo Savidge was once a budding heartthrob musician. Then tragedy struck and he chose to forsake stardom and all future affairs of the heart for a quiet life in the countryside as a music teacher. Petra and Arlo haven't seen each other since they were teenagers-when their feelings ran deep but the timing wasn't right. Now, seventeen years later, they run into each other once more. Might first love get a second chance-or will what keeps them up at night keep them apart forever? Freya - I see that you enjoy your kids, horses, cooking, pottery and writing...you have lots going on and yet you are starting on your 12th novel. What made you take up writing in the first place and what keeps you inspired to keep writing more? I will be reading one of Freya North's book soon. I already have some of them on my wishlist. And your little farm sounds lovely. I'm sure it provides a lot of inspiration. My daughter gives me that "grow up" look too. Oh I really want this! I love the cover! Thanks for the giveaway! Oh this was a good interview. Plus, you had me at raunchy! :D My cousin also loves Parelli's philosophy! Interesting interview though! I love horses too but no kids. looks like a sweet read for the summer. and congrats on the 2007 award for the novel! tanzanite is an interesting gem to read up on. fun to hear how it is "almost a character in itself" in the story. and, ooo, i plan on reading CAT's story as i'm presently enjoying the tour de france. Sounds like a great read. I'm interested to find out exactly what tanzanite is. Off to google it! I hope you like it! I also found one at the library, yay. I wonder what made you choose Rufus Sewell? He's an awesome actor and fits fluidly in so many roles! What made him your choice? The book sounds awesome and the interview was so interesting! I've heard such great things about Freya North so it was fun to read this interview. She is one of those authors I've always wanted to read. I've always had a soft spot for second chance at love stories. Pillow Talk sounds like a great one. I'd love a taste of Freya's lemon drizzle cake. Yum! Yes, please count me in the giveaway! When I first got married, I used to devour all of Freya's books. She is really very talented. Thanks for profiling Freya on your blog because I have not heard of her until now!! Her book sounds great! what a lovely introduction to Freya! i'm now having to hunt down more of her work to be read ") thank you ~ and for the generous giveaway ! Write because you need to tell a story, I think that is key! It's neat that she had the idea over a sleepwalker in the newspaper. I do want to read a book by her too, one is on my list to get already. They are fun and lovely. I am happy you found a new author to like! Love all the varied interest the author has...from dogs and horses to pottery! You know the book will have depth! I'd love to read it, please enter me! Great interview and I look forward to reading your work. I am impressed that she's a single mom living on a farm with her kids and animals! The farm sounds wonderful by the way. I'd love to enter - the book sounds great! Paperbackdaydreamer - yes, life is rather full...but I like to believe that the busier we are, the more time we're given to achieve it all. Someone once said if you want something done, give it to a busy person! Missie, Misha, Jenny, Kristi - thanks for this. I hadn't actually thought of actors in relation to my characters so it was a fun contest to do on my facebook page and yes, I rather think that Mr Sewell would make a very good Arlo! Diana - the cake is easypeasy to cook...it's one of those recipes where you plonk everything in the bowl at once and mix it together...and it never fails! if any of you are on facebook, I have a facebook page and often post up pics of my kids, horse, dog...recipes etc. I'd love to see you there! Finally, a big warm thanks from over the Atlantic to all of you - to loyal readers and new readers alike. And finally, finally - much gratitude to Blodeuedd for inviting me on to this great blog!